Mike and I spent the last three-ish days in Salta where we met our Peruvian friend from the hostel in BsAs., Valeria. It´s great to see Val again, and as some Canadians told me before they even spoke with her, you can see that she is a magnetic person. she has a really good vibe about her. and it´s true, evidenced by how she knows everyone everywhere we go. Val has this apparent preference for surrounding herself with english speakers though, so we haven´t spoken hardly any spanish since leaving Paraná. from one extreme to the other. Salta was super touristy. I hadn´t seen so many backpackers as i did there. in fact, we stayed at a hostel called Backpackers Hostel. it was pretty ridiculous. kinda fratty and if you can imagine, it was like stepping into a reality tv show. welcome to real world, salta! so within like 15 minutes of arriving, Val pitches this idea to us about adventure sports and sure enough an hour later she and the other gringos have convinced us to spend an entire day on zip lines. it was with this big extreme sport outfitter that does rafting, bungee, etc. mike and i were reluctant to get involved in something so obviously touristy but the photos suggested it would be worth it for the scenery alone. in the end the zip lines were a lot of fun too. i really enjoyed the 2 hour drive to and from the base camp. we were getting up toward the base of the Andes mountains, so there are lush rolling hills and small towns with fantastic little farmsteads structures. the zip lines were in a sort of river valley within a canyon. the actual zipping around (they call the activity ¨canopy¨) took some skill. Val had a close call when she was twisted around and the pulley caught her glove on the wire. it ripped the finger of the leather glove in two. sobering. 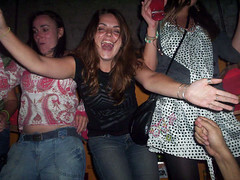 that night got a little wild once back in Salta. we celebrated a brit. girl´s birthday. there was an asado at the hostel with a folk band that was fantastic. afterward the party moved to a local bar. we spent the next day exploring a bit with Val. got our bus tickets to the border and got a mountain veiw of Salta. took a scenic walk down. laid back. so this morning we arrived in the northern-most town in Argentina, La Quiaca. we walked the 8 or so blocks into Villazon, Bolivia and it actually feels like a different country. the Andean culture is all around us. i keep expecting them to speak an entirely different language. i am thrilled by the dress of the women. this will sound dumb, but it´s like you see in the pictures… stout little women with weathered faces, in brightly colored costumes of layered skirts and sweaters, topped off with a bowler hat! it´s amazing! they arrange their hair in two long braids with tassels at the end. they wear thick woollen socks and sandals. it makes me so happy. we bought a sack of coca leaves and glasses of freshly squeezed orange juice. we have about 6 more hours to relax here and adjust to the altitude. the cocoa leaves will help a little with that. they´re pretty neat. you wad up a pinch and knaw on it for a bit. it numbs your mouth and you feel a nice buzz. what a great post! The zip lines sound impressive (and scary!) Interesting that it’s called “canopy” the same term is used in skydiving once the parachute opens you are “under canopy” until you land. Thanks for the link about coca leaves, very interesting. Glad to see you are enjoying the local culture! HI Erica! Zip lines sound like so much fun. It sounds like you are truly making the most of your life these days and I love hearing about it. When Erin was in Cuzco and the Inca ruins she used the Coca too, kind of like you do, as a tea right? Anyway, I think I owe you an email. . . Much love girl!